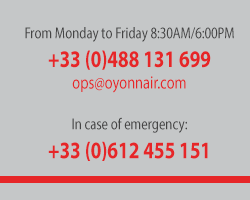 Oyonnair is an airline company which is specialized in medical transportation and cargo transportation. Based in Lyon Bron, Oyonnair was created in 1989 by Michel Maradan, specializing in business aviation for over 20 years. The company's aircraft and pilots operate an on-call 24/7, which allows a take-off within one hour. Regardless of your destination, Oyonnair will find the closest airport to your required destination. Oyonnair is an airline company. All flights are operated according to European public transport regulations. Oyonnair's fleet has worldwide insurance coverage. Oyonnair has an Air Operator Certificate and an operating license guaranteeing professional service. Pilots and flight engineers undergo regular in-flight and ground training. Our flight crews are rigorously tested by a certified flight examiner. Our pilots have a solid experience in business aviation and are professional, efficient and available 24/7.